Adidas - With a graphic nod to a classic style the adidas Collegiate Tee shirt gives little guys a grown-up look all their own. This sporty infants and toddlers' t-shirt has snap buttons at the shoulder making it easy to get on and off. 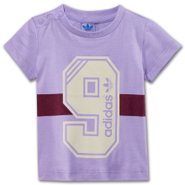 Adidas - Two adorably sporty toddler pieces come together in the adidas Training Jersey Set. The screenprinted top and elastic-waist shorts can be worn separately or as a set to give little guys the same athletic look as the big boys. 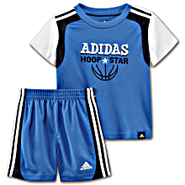 Adidas - Outfit your toddler in total hoops style with the adidas Basketball Set. The layered-look mesh jersey features a hoop star design on front and teams up effortlessly with the dazzle-stripe mesh shorts. 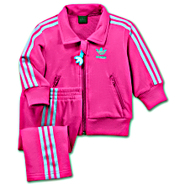 Adidas - You're never too young to have a winning style with the adidas Athletics Division Set. 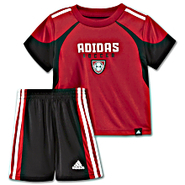 This cute toddler play set pairs a cotton jersey tee shirt with colorful 3-Stripes shorts for a fun sporty look. Adidas - Even the littlest boys can show big athletic style in the adidas Polo Set. Pairing a boldly striped cotton polo with soft peached athletic shorts this cute toddler set is made to keep your little guy comfortable all day long. 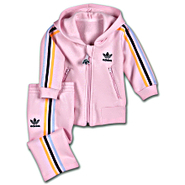 Adidas - Infants & Toddlers Firebird Fleece Track Suit All cotton and altogether adorable the adidas Firebird Fleece Tracksuit takes a classic look and gives it a girl's-specific fit. Sporty and comfortable it's been updated for the season in a fresh fun color. 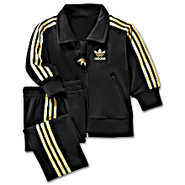 Adidas - Infants & Toddlers Firebird Track Suit All cotton and altogether adorable the adidas Firebird Fleece Track Suit takes a classic look and makes it toddler-size. Sporty and comfortable it's been updated for the season in fresh new colors. Adidas - Twice as cute as ordinary hoodies the adidas Reversible Track Top is solid colored outside and striped inside. With an authentic full-zip style and a lower back Trefoil print this toddler track jacket offers two looks in one. 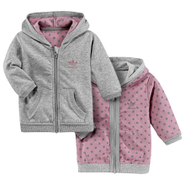 Adidas - Infants & Toddlers Hooded Flock Track Suit The adidas Hooded Flock Track Suit covers your little one in comfort from top to bottom. Soft and cozy in fleece the pull-on pants and hooded jacket of this versatile set can be worn together or separately.